This album is professionally recorded using state of the art digital recorders on location in numerous Queensland and Northern Territory remote tropical rain forests. It does not contain any music, words or anything else other then the sounds from a rain forest as if you were sitting there in person. The various sounds on this CD include birds, frogs, insects, rain drops, wind on trees and gentle running water from tropical streams. It is recorded in stereo format and the different sounds can be heard with depth, clarity and binaural effect. 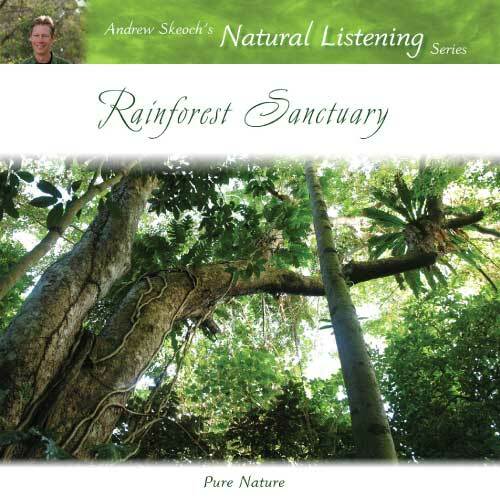 Sound recordist Andrew Skeoch and his wife and photographer Sara Koshak traveled to some of the most stunning remote rain forests in Australia to capture the beautiful and relaxing sounds you hear on this CD. Andrew is known and respected worldwide for his ability to capture the true essence of mother nature. When it comes to rain forests, Australia is blessed with some truly spectacular examples that contain a multitude plant and animal life. Some of the birds you will hear on this CD are in fact rare and never before heard on any type of nature recording CD. You can hear every leave gently stir with the wind and rain as you can hear every harmonic bird and frog noises as they go about their natural daily activities. Rain forest Sanctuary presents the Australian wilderness in all it's natural and untouched glory. Andrew and Sara venture deep into the Australian jungle to capture nature's own choir heard as if you were literally sitting their in the middle of a forest. The best thing is, you can experience this in the comfort of your own home and enjoy the immense benefits of deep relaxation and focus that using this CD will give any listener.